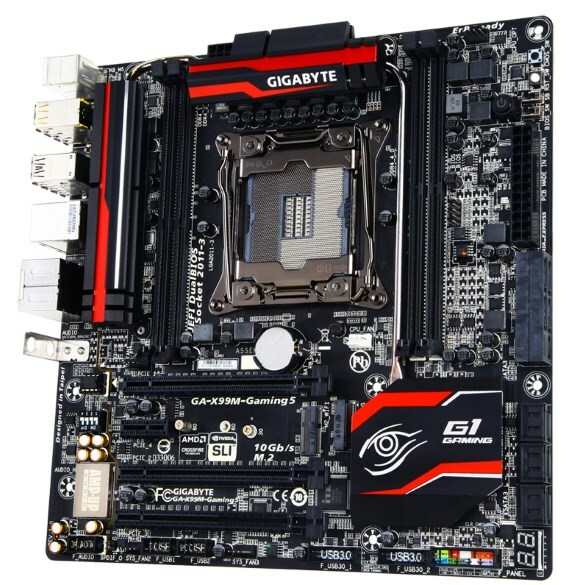 Gigabyte introduces the GA-X99M-Gaming 5, the company's first Haswell-E motherboard that uses the Miro-ATX form factor. The smaller form factor results in just four DIMM slots instead of the eight memory slots found on the ATX version, and you're also limited to a maximum of four expansion cards. Another change is that the two M.2 slots don't connect to the CPU. The Tech Report has some more details and speculates the board may hit the market for around $230- $250. That's right: I said two M.2 slots. The first is connected to dual storage-specific lanes in the chipset, while the second has an x1 link meant for mini wireless cards. Kudos to Gigabyte for letting folks add PCIe-based Wi-Fi without monopolizing one of the full-sized expansion slots. Wired networking is handled by a Killer NIC, because gaming, while audio is piped through a high-end Realtek codec. The integrated audio has the usual embellishments in addition to a socketed amplifier chip. There are also four "DAC-UP" ports tuned to deliver cleaner power to USB audio devices. These yellow-colored ports use an "isolated power source" to provide "the best audio experience possible," but it's hard to see why four are necessary. I doubt audiophiles are cobbling together surround setups with multiple stereo DACs.